Bill O’Reilly‘s talking points memo addressed how the 2016 presidential election should be an easy win for the Republican party, saying that voters disliked how far left the Democrats were becoming. He did say, however, that Donald Trump‘s shake-up of both sides leaves everything hanging in the balance. O’Reilly began the show by bringing up a list of gripes that he places blame on the left: from the continuation of entitlements, to the Middle Eastern quagmire. O’Reilly went on to say that Trump has managed to greatly stand-out with his “over-the-top” rhetoric and charisma, but he also noted that Trump could be good news for the left if the GOP can’t come together while picking its nominee. 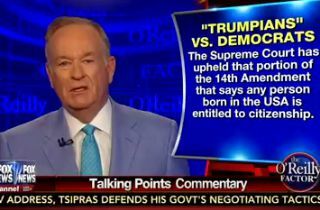 O’Reilly then brought up Trump’s idea of mass deportations for illegal immigrants, as well as so-called “anchor babies” who possess American citizenship. The host brought up two cases in which the 14th Amendment survived constitutional challenge, saying that not only does Trump’s idea have a strong likelihood of being struck down as unconstitutional, but that it also gives the left more reason to brand Trump and, by extension, the GOP as racists. O’Reilly concluded by giving his thoughts that there should be a way to fix or revoke the law in order to fix current immigration problem. At the same time, he noted that despite his earlier statements, Republicans could lose to the the Democrats if they appear to be more extreme than their counterparts.